Romantic Hideaway - single family home with large private yard and off-street parking. Walk to Stearn's Wharf or stroll to the Funk Zone and world-class State Street shopping and dining. One block from beautiful Chase Palm Park, the Harbor, and Beach. Perfect romantic hideaway with old world charm combined with a modern kitchen and bath. Designer decorated for casual beach living. No smoking allowed. Leave your car behind and enjoy the best of California living! We live in Buellton, CA and have always dreamed of owning a home in Santa Barbara. We have recently retired and purchased and redid this wonderful cottage for us, our daughters, and our 8 grandchildren to use and enjoy. We love sailing off the California coast and feel so lucky when staying at Casa Capricho and being able to walk to the boat at the harbor. We initially purchased our vacation cottage because one of our children was attending school in this location, but we quickly fell in love with this beautiful city and all of the cultural and outdoor activities that it offers. 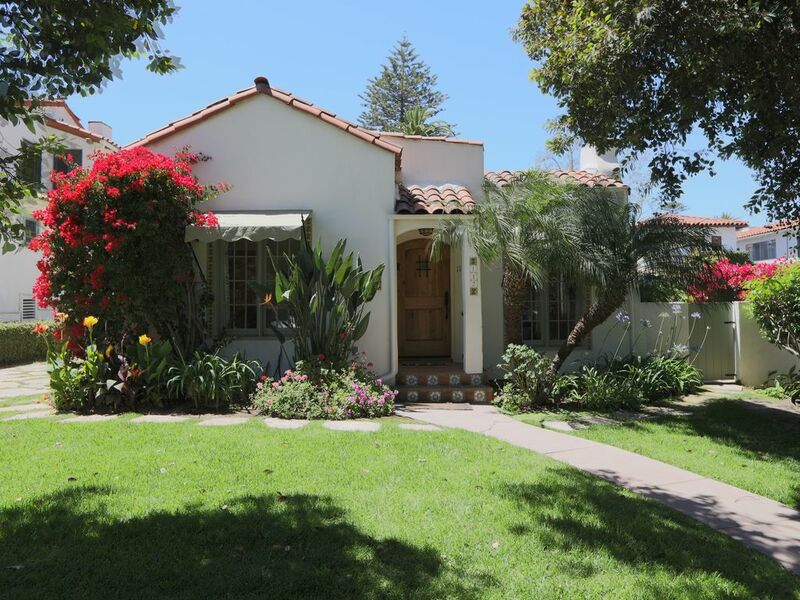 We love the Spanish Colonial charm of our cottage, our private garden with orange trees and our quiet neighborhood. We especially love the fact that we can walk everywhere! We take daily walks along East and West Beaches to Shoreline Park or out on Stearns Wharf. We love to walk to our favorite restaurants, Brophy Brothers and Enterprise Fish Company. We often walk to the movie theaters on State Street or to the Farmer's Markets on Tuesdays and Saturdays. We walk to the Santa Barbara Sailing Center, where we can rent a sailboat by the hour or take whale watching cruises. We walk to our Athletic Club to work out, to East Beach to pay beach tennis or volley ball, or to West Beach for swimming or tennis. We often picnic at Shoreline Park. We love the proximity of Santa Barbara City College and the opportunity to take classes there. We also love all the cultural events offered at the Lobero and Granada Theaters and other venues accessible by foot. We enjoy the benefits of the activities of the Maritime Museum, the MOXY museum of science, and the Ronald Reagan Museum with all of their offerings and all within walking distance. It is truly a dream come true to spend time in this city. Walking distance from State Street shopping and one block to shuttle if you don't choose to walk. Walking distance to Stearns Wharf, the Harbor, and Funk Zone. Totally enclosed yard and outdoor dining area with citrus trees. Walk to Stearns Wharf, beach, Harbor, boating & kayaking. Walk to fabulous State Street shopping & Dining. Enjoy the trendy new Funk Zone wineries, shops and local beers.